1. 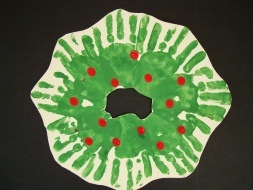 Pour some green paint into a paper plate or shallow dish. Lightly dip hand(s) into paint and press hand prints in a circlular shape onto a piece of paper. 2. Pour some red paint into a separtate plate and dip a finger(s) into it. Press it onto your wreath to make your berries. 3. Cut out your wreath around the hand prints. You can make this even easier for little ones by cutting out the wreath shape first and then have the child press their hand print all over the paper, this way they don't have to try and make their hand prints in a circle. Sometimes handprints are better made by brushing the paint onto the hands and then pressing onto paper. Too much paint on the hands can make smooshy prints and will also make your paper ripple much more! But in the end it's the process, not the product... sometimes it's more fun to put your hand into a big blob of paint!